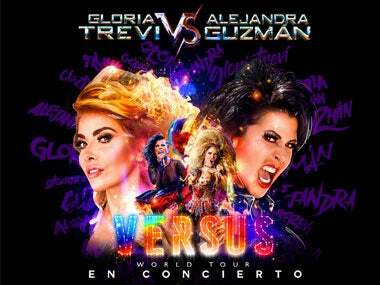 Sacramento, Calif. – Gloria Trevi and Alejandra Guzmán's 'VERSUS World Tour' begins its final leg this spring with a stop at Golden 1 Center in Sacramento on Thursday, April 12. Tickets for Golden 1 Center are $169.95, $129.95, $99.95, $79.95, $69.95, $49.95 and $39.95. Tickets for the show goes on sale Friday, January 19 at 12pm at LiveNation.com. The long-awaited return of the 'VERSUS World Tour' to the United States, country where the tour began, will have its grand finale with concerts that include a magnificent closing night at the Hollywood Bowl in Los Angeles, city where the two icons return after becoming the first Mexican women to sell out the famous STAPLES Center two consecutive nights. Now, the Mexican superstars will make history once again, this time in another legendary venue where the two artists will join forces to break a new attendance record. The acclaimed tour will also make a stop in Toronto, Canada; country that they will visit for the first time in March. The presentation will take place at the Sony Center for the Performing Arts, one of the most iconic venues in Toronto in which great internationally renowned figures such as Elton John, David Bowie, Elvis Costello, Bob Dylan and others have performed. Gloria Trevi and Alejandra Guzmán are undoubtedly two of the mostrepresentative icons in Spanish-language music and have influenced entire generations with their music, style, ideology, and performances, cementing themselves as the most transcendental and successful creators and exponents of Mexican pop/rock of all time. On sale for Sacramento general public: Friday, January 19 at 10am. Citi® is the official presale credit card of the 'VERSUS WORLD TOUR.' As such, Citi cardmembers will have access to purchase presale tickets beginning Tuesday, January 16 at 12pm, until Thursday, January 18 at 10pm through Citi's Private Pass® program. For complete presale details visit www.citiprivatepass.com.